April 9, 2018 | April 9, 2018 | Judy Grundfest recently was made a lifetime member of the UAMS Donald W. Reynolds Institute on Aging Community Advisory Board by the board’s executive committee. A member of the board is eligible for lifetime status after serving with distinction, said Larry Alman, board chair. They retain all the rights and privileges of regular board members. Grundfest is the fifth member of the board to be honored as a lifetime member. The other four are Sissy Clinton, Jo Ellen Ford, Martha Murphy and Judy Snowden. Grundfest was an active volunteer in the early years of the institute’s 20-year history, especially in the effort to raise funds to build the Reynolds Institute’s building on the UAMS main campus. She worked diligently with other board members on a campaign that raised a total of $24 million in two fund-raising campaigns. The result is the eight-story building that houses clinics, research and administrative offices. She was the second person to lead the Community Advisory Board as its chair from 2001-2002, and has been a board member for a total of more than 12 years. In 2005, Grundfest was awarded the Jo Ellen Ford Distinguished Service Award by the Advisory Board. 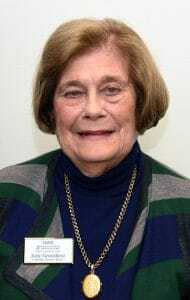 The board noted at the time her important contributions and volunteer work in establishing the Ottenheimer Therapy and Fitness Center at the Reynolds Institute. She also serves as chair of the Ottenheimer Brothers Foundation. The Reynolds Institute on Aging Advisory Board members serve as ambassadors to support and publicize the Reynold’s Institute on Aging’s mission, which includes eight Centers on Aging located throughout the state where the needs of an aging generation are met with the highest standards of service, research and care.